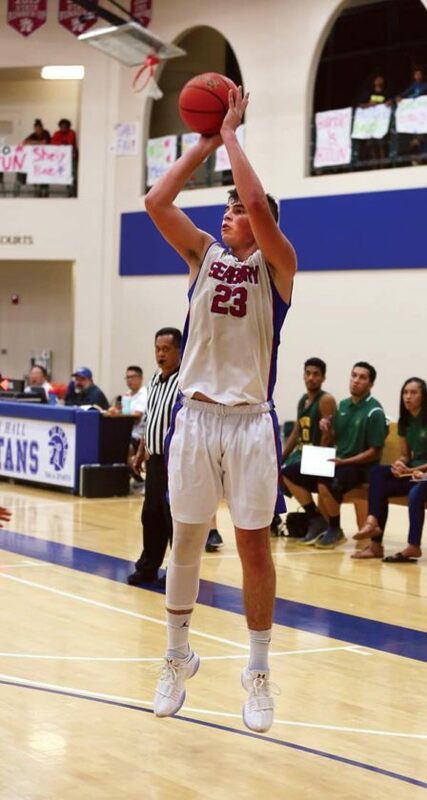 OLINDA — This one wasn’t close for very long, but the Seabury Hall boys basketball team got to play a home game in front of a rare packed house in the Erdman Athletic Center on Friday night. 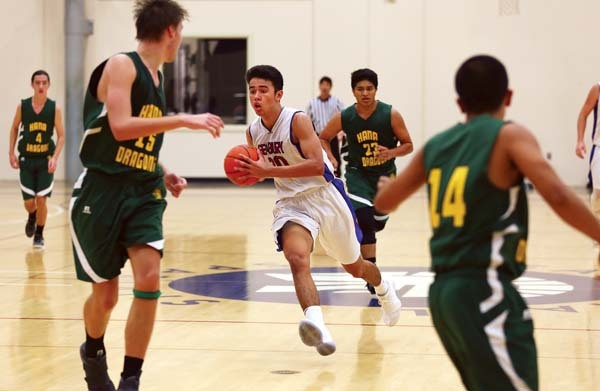 As the school celebrated senior night for all of its winter sports, the Spartans boys basketball players ate up the atmosphere in a 65-19 win over Hana in a Maui Interscholastic League Division II matchup. Payne has been a starter on teams that have advanced to the Division II state title game and final four in the last two seasons. 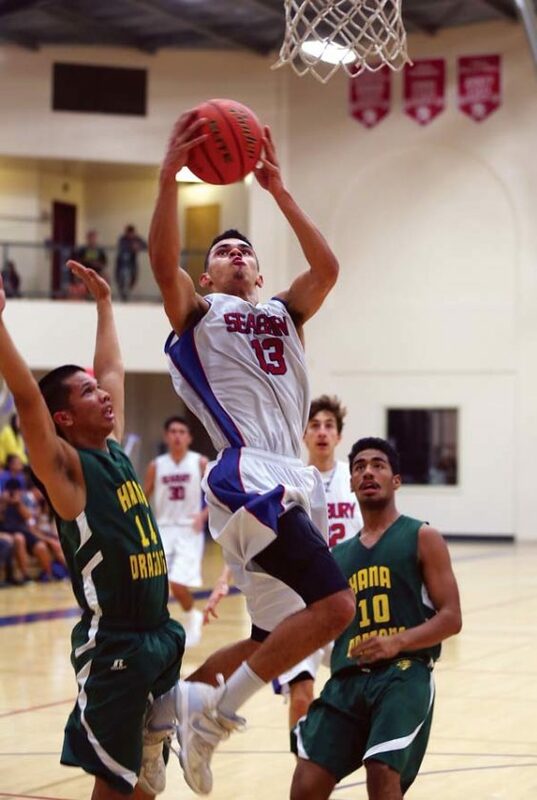 His jumper gave Seabury Hall (5-0) a 6-2 lead with 5 minutes, 47 seconds left in the first quarter. His pass to 6-foot-4 junior Conner Jenkins led to a layup that pushed the lead to 20-4 at the end of the first quarter. Payne will choose between track and basketball as he considers his college destination. He has a scholarship offer from Brown University for track and he is talking to Sacramento State and Grayson University for basketball. Jenkins had 14 points to lead 11 players who scored for the Spartans, who are seeking their ninth straight MIL Division II title. Kama Konohia added 11. Senior Yosef Moeai led the Dragons (0-5) with six points. His father, Fou Moeai, is the Hana head coach. Carson Whitwell 0, Chayton Keegan 5, Yosef Moeai 6, Kaleb Estrella-Pu 0, Keoki Hoopai-Waikoloa 5, Kaua Medeiros-Lind 0, Shayden Hoopai-Waikoloa 0, Owali Moeai 0, Nahinu Lind 3, Elijah Keegan 0, Huaka Park 0, Blade Hoopai 0, Cyrus Cook 0. Isaiah Payne 12, J.D. Pells 2, Gabriel Medallada 2, Rolando Berdal 2, Noah Payne 2, Conner Jenkins 14, Kama Konohia 11, Brayden Hasegawa 4, Carl Molinaro 0, Kai Preseault 4, Caden Granum 7, Joaquin Donez 5.